This new textbook, written in conjunction with the IET, has been designed as a complete companion for learners taking this course, giving them all the information they need at this level in a step-by-step, accessible way. Covering all the core units, and linked throughout to City & Guilds online learner and tutor resources on SmartScreen.co.uk, this is a comprehensive reference guide for all learners at this level. James L Deans, Paul Harris, Andrew Hay-Ellis, Trevor Pickard and Peter Tanner are all experienced lecturers, tutors and practitioners. I have been using this book in combination with my college course for the C&G 2365 and it has proved an invaluable asset. It is well laid out, clear and very informative. key points are highlighted in the book and it has questions and a checklist at the end of every section to ensure you have understood. With this being from the same people who do the exam, the information they put in this book is highly likely to come up in the exams, so by going through this book I hope to give myself a edge going into the exams. If you are on this course then buy this book, it will defiantly help you. Excellent book I will definitely recommend it to anyone who is doing this course. 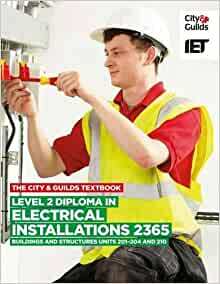 This is a must get book for anyone studying Electrical technology even though it particular for City & Guilds. That's what I think but hay, I have only started this book three weeks ago. 2.0 out of 5 starsOrder basic electrical installation work level 2 if new to electrics. This is full on tech manual, all formulas and a degree in maths needed. You want the other book as new to the trade. 5.0 out of 5 stars... to pass my course did the trick and would recommend. Have used this item to pass my course did the trick and would recommend. bought this while doing level 2 and to be honest i didn't even use it lol it was just extra weight making my bag heavy...passed the course 1st time.